Listen online most Tuesday mornings at 11:00am PDT, and most Thursday afternoons at 3:00pm PDT. Subscribe to the podcast via Sermon Audio. 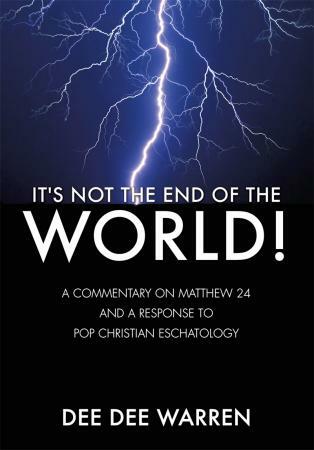 This entry was posted in Dee Dee Warren, Dispensationalism, Eschatology, Hyperpreterism, Podcast, Preterism, Skepticism and tagged It's Not the End of the World, Matthew 24, olivet discourse by Chris. Bookmark the permalink. One of the primary critiques Chris mentions is reading back into the text of Scripture one’s own particular context. This is the error of dispensationalism. They misunderstand the language of the Bible because they don’t understand how the Bible speaks. DD and Chris make good points along these lines. I would like to follow their train of thought and apply their words to Matthew 25. The problem dispensationalism faces is a literal reading of Matthew 24 when Jesus says what he says about the sun the moon and the stars. If a person does not understand prophetic judgment language, error Will follow when that language is read by that person. So, because dispensationalism doesn’t understand prophetic language of judgment they misinterpret Jesus’s words. I would challenge that this is what happens in Matthew 25 as well. Because the reader thinks the language speaks of judgment in such a way that It can only be at the end of time, that’s what he imposes on the text. I think it very strongly that to make this break between Matthew 24 Matthew 25 is very much a butchering of the text. There is no reason not to read the parables in Matthew 25 as consecutive with Matthew 24. All of the book of acts and the book of Hebrews and many of the epistles and the revelation speak of the judgment that Jesus mentions in Matthew 25. The point in the first century is in whom are you going to take refuge? And how will you treat the apple of God’s eye? Matthew 25 is not some generic application made for all time about how certain people are treated. Matthew 25 is specifically about prophetic warnings against abusing Jesus’s bride. The language in Matthew 25 is not literal but covenantal. Just like the cosmic language of destruction is established in the Old Testament so to the language of national judgments by God. The call of the disciples to go out and make disciples of the nations by preaching the gospel to the world is a call not only did Jews but also to Gentiles as the book of acts demonstrates. In the world at that time all of the nations knew about the God of Israel and had synagogues throughout their societies so that when the judgment against Israel came in AD 70 there have been plenty of warning About which side one should be on when the hammer fell. The transition between the old covenant and the new covenant lasted 40 years and was the same as the transition from the former heavens and earth to the new heavens and earth. Hi. I do an internet broadcast and wanted to see if you would come on to discuss dispensational premillennialism and how the 70 week prophecy has no gap. Thanks. Can you tell me more about your broadcast? Do you have a link I can visit?